Based in Irving TX, Keneric Healthcare is a medical device company dedicated to the development of innovative products and improving patient care. Having proven success in pharmaceuticals, healthcare manufacturing and global distribution, the founders of Keneric Healthcare looked for appropriate solutions to the growing problem of chronic wounds. 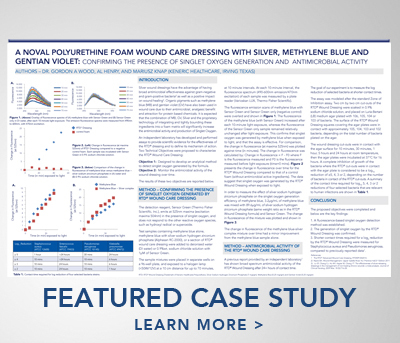 That research resulted in a truly unique product, which became the RTD® Wound Dressing, a FDA approved, highly absorbent, ready to use polyurethane foam dressing. 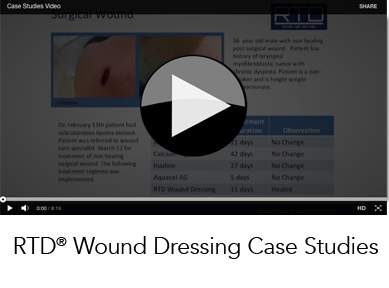 Customer trials in 2013 showed that RTD® was effective in providing all required components to achieve faster closure and complete healing of chronic wounds – without the time sensitive, moisture monitoring required by other foam dressings. The result was a product that not only increased closure rates, but became an essential product for clinicians looking to reduce maintenance time. We are asked all the time, what does RTD® stand for? RTD® stands for “Retro-Tech” Dressing; signifying the materials, process and history of our revolutionary product. The “RETRO” part of RTD® lies in the antimicrobial components; methylene blue, gentian violet and silver. All three of these components have an extensive history of having antibacterial, antifungal and analgesic properties. The “TECH” part of RTD® is based solely around the proprietary capillary suction foam, and how it interacts with the three antimicrobials, as well as the exudate it comes in contact with. RTD® is super absorbent, and due to its novel construction, absorbs vertically – reducing the chances of maceration at the edges of the wound. Another innovative feature is the process by which the antimicrobials are bonded to the matrix, not allowing leeching of the ingredients into the wound bed, which allows RTD® to be used throughout the continuum of care; with no cytotoxicity issues. From those small beginning trials in 2013, Keneric has become a vibrant company, committed to providing innovative products that enhance not only the lives of patients, but the lives of clinicians and care givers as well. Keneric Healthcare is actively developing our distribution network. Click here for a list of both domestic and international distribution partners.